Taking on the 2017 Harvest Moon Hustle was like meeting an old friend for Bill Udell. “It’s my favorite running event. It’s the one race I won’t miss every year,” he said. He’s competed in the Harvest Moon Hustle since it’s inaugural year in 2011. Udell wasn’t a first time runner, and he wasn’t a newbie to Pink Gorilla Events, either. 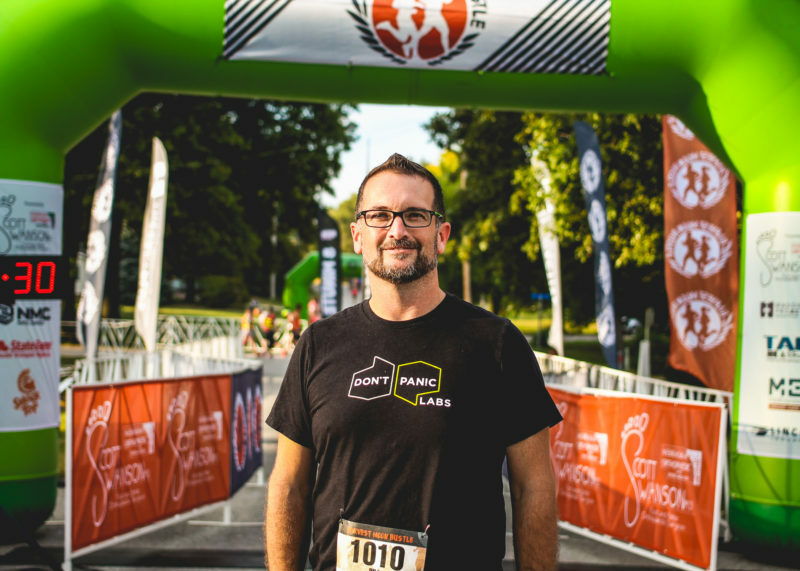 He’s a partner at Lincoln’s very own Don’t Panic Labs, which is an early stage software development company that is working with Pink Gorilla Events for this year’s Market to Market Relay Nebraska. “It turns out that for Market to Market Relay, scheduling the wave times is a long process for race director Ben Cohoon and takes him a week of real calendar time. We’re creating software that basically takes that away from him.” Indeed, it’s a huge puzzle putting together starting wave times for M2M Relay and we’re excited about using technology to improve the process and result. Thanks for running Harvest Moon Hustle, Bill, and good luck at Market to Market Relay Nebraska!